The government in the Taiwanese city of Taichung deserves praise for designating many of its street trees "protected trees." The majority of these special trees are old, large or have some religious significance. This tree is a Ficus microcarpa, locally known as the Taiwan banyan. A hardy species, it is very popular with avian wildlife, and many species of birds enjoy its fruit. Both Taichung and Taipei (Taiwan's capital) are in the process of tagging and labelling all of their street trees, which includes a small sign or tag depicting the tree's species along with a QR code. 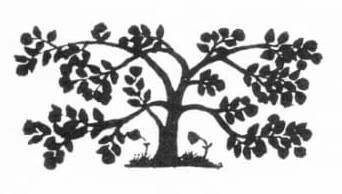 They often add basic information about the tree to educate the public about its importance, either on the tree itself or nearby. This tree (#0216001) is located steps away from the new railway station in the center of Taichung. Photos taken in April 2017. 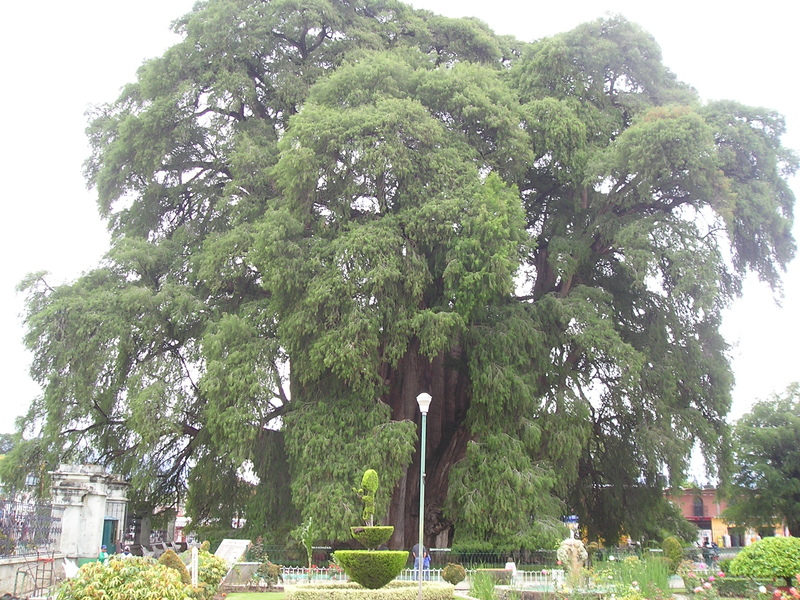 The famous "Arbol de El Tule," near Oaxaca, Mexico. 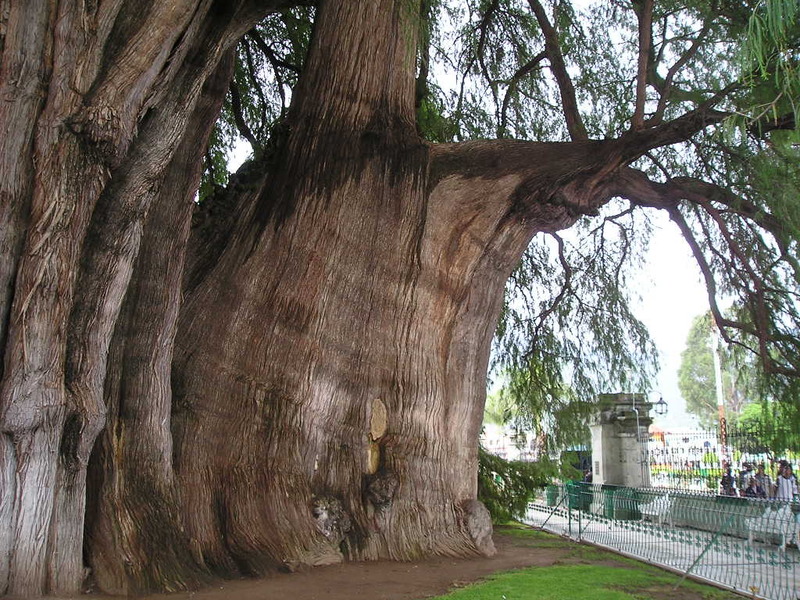 This gigantic ancient cypress (Taxodium mucronatum) is Mexico's most famous sacred tree. It has long been considered as a magical tree by the indigenous people of the region, and often had offerings attached to its boughs and trunk, including great numbers of human teeth and locks of hair. Probably to deflect religious interest from this tree, Catholic missionaries built a church nearby several hundred years ago. Today, this two-thousand-year-old tree, whose trunk measures 45 feet (14 meters) in diameter with a height of over 125 feet (38 meters), is surrounded by the church courtyard. It is a popular tourist attraction and is visited by thousands of people from all over the world each year. Despite its apparently protected location, this venerable giant's survival is threatened by general neglect, a shrinking water table and increasing urbanization. Photos taken in 2011. For more information about this magnificent tree, click here. This beautiful gingko tree is approximately 400 years old and was one of the few trees that survived the firebombings that devastated much of Tokyo during the Second World War. Located on the grounds of a Buddhist temple and cemetery, the bark of this ancient tree still shows charring from the fires some 70 years before. Photo taken in 2012. Pomegranate tree, Anadolu Kavağı, Turkey. 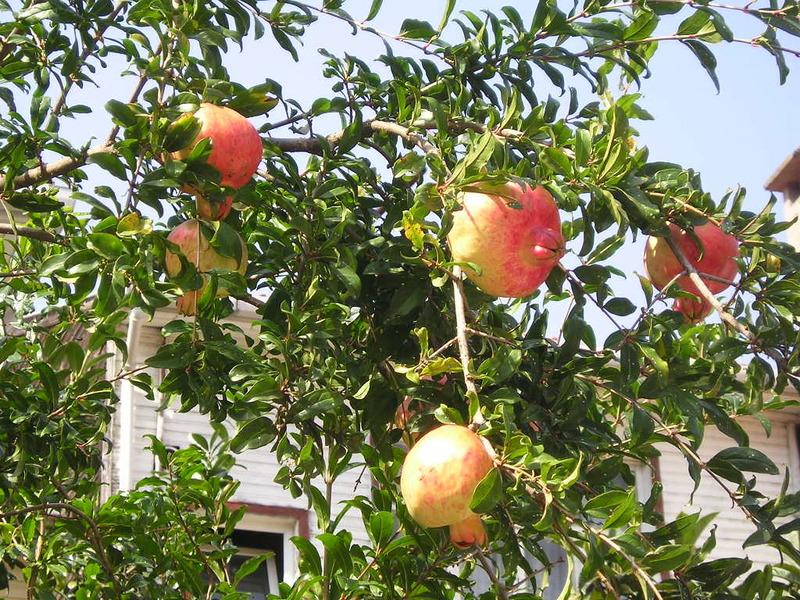 The pomegranate (Punica granatum) is considered to be one of the most sacred trees of the Middle East as both a Tree of Life and a Tree of Knowledge in the Garden of Eden. In Palestine, it was believed that every fruit of this tree contained a seed from Paradise, and to this day fresh pomegranate juice is given to babies in the hope that the juice from the "Paradise seed" will be consumed by the baby. Photo taken in 2005. Japanese Cedar at the Makata Shrine, near Narita City (Chiba Prefecture), Japan. The Kanto region's largest Japanese cedar (Cryptomeria japonica) rises into the sky beside the famous Makata Shrine. This magnificent cedar (known as sugi in Japanese) is estimated to be 1200 years old. It measures 26 feet (8 meters) across at eye level, and is over 130 feet (40 meters) high. 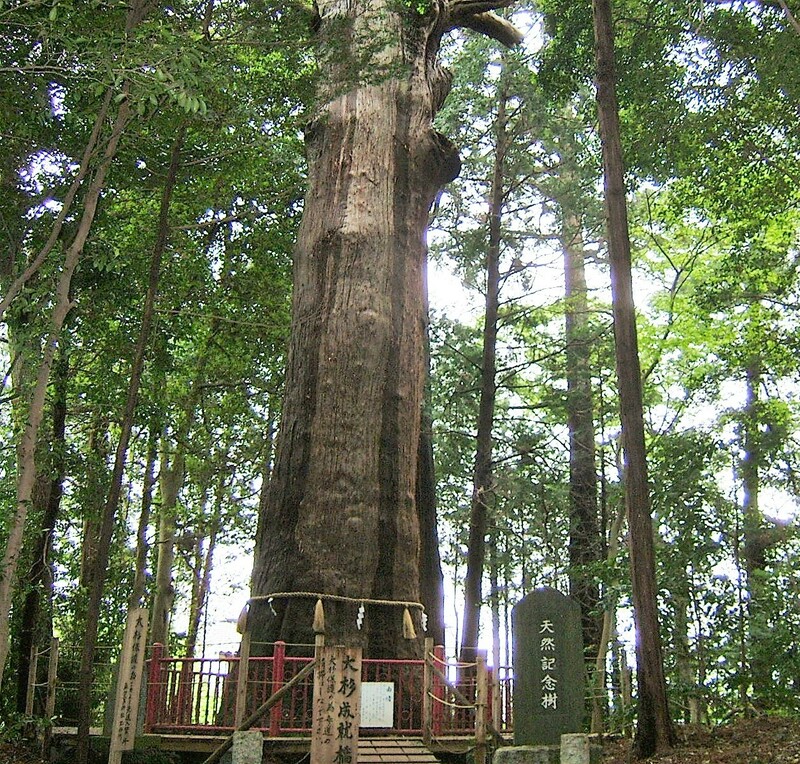 This ancient tree is revered as a guardian of longevity and as a protector against evil by both Buddhists and practitioners of Shintō, the ethnic religion of Japan. It has been designated a "natural monument" by the government of Chiba Prefecture. Photo by Masashi Tamura.